MINI Cooper Acccessories + MINI Cooper Parts :: OutMotoring.com MINI Blog :: MINI Accessories :: Wear out the competition, not your floors! Rennline’s Track Mats give your interior the purposeful look of a race car and are the perfect solution for protecting your interior from the wear and tear of track driving. The only aluminum floor mat of its kind on the market, Rennline’s Track Mats are inspired by the floor design of factory race cars to provide drivers a smooth flooring surface that enables the quick footwork demanded of track driving. Rennline’s Track Mats are constructed from lightweight anodized aluminum, weigh less than 38 ounces, and are stamped with reinforcing ribs for strength. 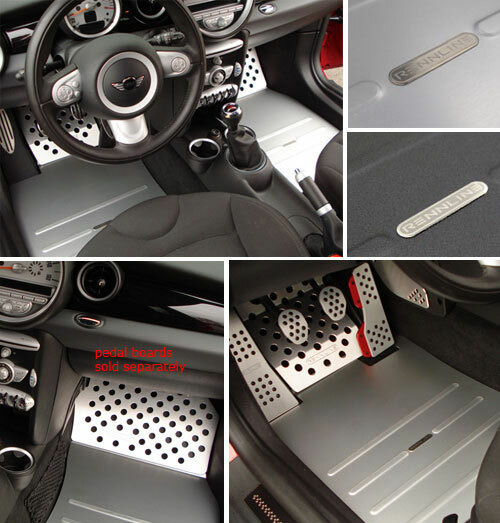 They fit precisely over the contours of car floors and affix with Velcro or can be permanently mounted if desired. For automobiles with molded one piece carpets, Track Mats fit directly over the non-removable floor carpeting and can be covered with the factory floor mats when not in use. One of the main benefits of Track Mats for these automobiles is the protection they afford the floor carpeting, which wears rapidly when the loose floor mats are removed for track driving. When not in use, Track Mats can be removed or simply covered with the stock floor mats. Comments on Wear out the competition, not your floors!